Looks like gaygooners (and I) are semi-famous in Italy! "Homophobia and racism, two of the most unpleasant symptoms Inglese Disease, the disease that sapped English football in the last decades of the last century. When going to the stadium in London, Manchester or Leeds was an experience anything but relaxing. The fist fights between hooligans, the launches of bananas players blacks and racist chants were an unfortunate constant in most arenas across the Channel. Since then the acciaccatissimo Beautiful Game has come a long way on the path of redemption. Are not all rosy, of course. As circumscribed episodes there are still stigmatizing. In the stands, but also in the field. Just over a rectangle of game four years ago, the former England captain John Terry spoke of racial abuse at Anton Ferdinand, brother of the famous Rio, during the match of Premier League Chelsea vs QPR. Immediately after the incident came up a huge fuss and was discussed at length on the effectiveness of anti-racist initiatives such as Kick It Out, according to the same Rio Ferdinand too timid in its modus operandi. Sure, it's worth repeating, there is no comparison with respect to what occurred in the seventies or later in most of the nineties. In those decades it was also surely unthinkable progress today in the fight against homophobia. While we have the president of the National Amateur League Happy Belloli were somehow women's football as a sport practiced by "four lesbians who demand only money", in England some of the major professional clubs officially recognized supporters club openly gay and lesbian. Dave Raval and Marcel Graves are members of some of these clubs. We met them in London, in a pub in the East End of London. Precisely in Hackney, near by an immense green space, Sunday theater of dozens of amateur football match. "We are in the Gay Gooners 250. The 30% are lesbian, while 15% are people living all 'abroad. With the latter sometimes we meet at the stadium, otherwise we feel often through social networks. For some 'time we also have our banner that we display proudly in the stands at the Emirates Stadium (Arsenal plant, ed), "explains Dave, supporters of the team in London. 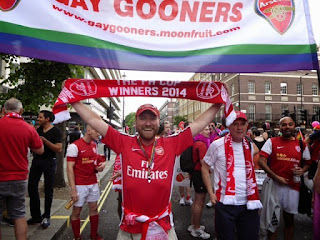 Just Arsenal became the first English football club to recognize officially in 2013 a fan club gay, while the absolute first to join were the Gay Villans (supporter of Aston Villa) towards the end of last decade. Now around the country for this type of situation there are another 20, born in the space of 2-3 years. "Actually - it still tells Dave - even 20-30 years ago there were small groups 'illegal', which ended up meeting some pubs especially during the trips." Relations with Arsenal are very good. "The French coach Arsene Wenger never fails to support us, also we meet every three months and the leadership we coordinate with them to carry out a series of activities. For example, before a game last February, that the UK was the LGBT History Month, we marched in the field with our banner. With us it was also the former player Pat Rice, one of the legends of the team's recent past. During that game on electronic panels on the sideline it appeared half a dozen times the rainbow flag and the message 'Arsenal is for everyone' '. That the team of North London is actively committed to defending the rights of her gay fans proves it to another incident that occurred at the beginning of 2015. Arsenal had to play a cup match in Brighton, which is reputed to be the largest city Gay Friendly UK. For this reason when you go away the fans often sing the chorus "your boyfriend know you're here?" The supporters opponents. "A form of homophobia in 'low intensity', but still to stigmatize," says Dave. "That's why we reported it to Arsenal, who sent an email to all those who had bought tickets for the match against Brighton and put a notice in the program's home match which preceded the challenge cup to specifically ask for not sing the choir. 3-4 The people who did were immediately blocked by other spectators and the police. " Cultural change is now in place. Homophobia and racism begin to no longer be tolerated, so much so that many people who witness acts of discrimination do not remain passive. Very different context than when in the eighties football clubs 'dissuaded' supporters blacks to follow their team away because they could not guarantee their safety or homophobic slogans were recurring almost everywhere. Dave and Marcel are surprised by how fast they are occurring all these steps forward, no doubt facilitated by the national campaign "Football vs Homophobia". "For the team that I support, the Norwich City in the eighties played Justin Fashanu. A player homosexual who was profoundly discriminated against in the world of football, even from his brother John, he too a famous footballer. " Accused in a pretext of sexual harassment, Justin committed suicide at the age of 37. "In February, all the players of Norwich put boots to the laces in the colors of the rainbow and also our clubs, Proud Canaries, has the respect and attention it deserves," says Marcel. Dave is keen to stress the aspects that still need work. "In London clubs of gay fans have never had problems. Ours is a very open and tolerant city, but anywhere else I know of unedifying episodes. " Marcel confirms the existence of unpleasant situations talking about his experience in an amateur team made up of homosexuals. "In the end I stopped because I did not feel completely comfortable in that environment." In the football prejudices die hard, as we demonstrate various "incidents" occurred on social networks, especially on Twitter, and you have seen the participation of the "insiders." Among these Ravel Morrison, recently put under contract by Lazio, and the pundit and former Liverpool striker Stan Collymore, both guilty of having written tweet with homophobic insults. A player of the Welsh Premier League, Daniel Thomas, was even arrested for heavy assessments made via Twitter against the national Olympic diver Tom Daley UK. Ironically, another Thomas, Gareth, captain of Welsh rugby, was the first British sportsman to come out while he was still in business, in 2009. A gesture that has had a major impact nationally and internationally. Actually there is a player with a past in the English Premier League has publicly stated to be homosexual. It is the German and former Aston Villa midfielder Thomas Hitzlsperger, but revealed his secret after leaving the competitive activity. When is coming out of the players in the prime of their careers? "I can say that within the team we know very well if there are components that are gay, and there are none. But outside this thing not leaked yet, "Dave assures me, that is a laugh when I remember the statements made some time ago by former Italian national coach Marcello Lippi -" In 40 years of football I have never met a gay footballer "- and Antonio Cassano -" Gay in the national? They are their problems. But I hope not. " If in England we complain that the Football Association could do more on the issue, what should we say in Italy, where it is easy to predict that clubs like Gay or Gooners Proud Canaries have many difficulties to gain acceptance?"